Back in the late '80s I was running a Golden Age Supers RPG campaign. My Wacky Brother Steeve was really into Doc Savage and he decided to play the Man of Bronze. I made Doc the leader of a group including Captain America, Wonder Woman, Tarzan of the Apes, and a pre-adamantium version of Wolverine. I did one game which involved Doc's "Crime College", where he performed brain surgery to remove the criminal tendencies of the crooks he captured. I had the villain of that adventure using a device to mind-control some of Doc's "graduates". Now, Doc had not yet revealed the existence of the "Crime College" to the other characters, and since the players were not that familiar with Doc, they were shocked to learn about it. "You do WHAT???" "I remove their Crime Gland," Steeve said in his deepest Gary Owens voice and a perfectly straight face. "There is no such thing," said my buddy Russ, who was playing the Golden Age Atom complained. "You know, Atom," Steeve continued, "The Crime Gland is right next to the Skeptic Gland in the brain. I could take care of that for you if you liked. YOu'd be much happier." I've been wanting to play a Pulp RPG ever since Dragon magazine published a mini rulebook for one called CRIMEBUSTERS. (80's maybe?) One of these days i'll get a group together. Just too busy right now. 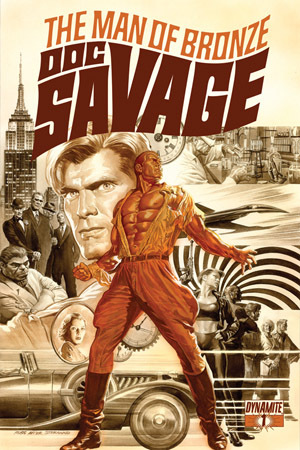 I just saw the Alex Ross cover, a Steranko/SHIELD homage, I wonder what the connection is there if any, did Steranko do a Doc Savage book? Hey, I like that cover. Not surprising since all Steranko work is awesome, but it's true to James Bama's depictions in its style and muted colors. That's the problem with the Dynamite cover in the first link. Doc's not bronze enough, his skin color is the same as the other caucasions. I've only read a few of the books and I know that's not right. The second issue did get a little better, I could see the book growing on me. And the art is fine, better than most current newspaper strips, but I won't be entirely happy until it's drawn by someone else. I heard Doc Shaner will be drawing a new Flash Gordon strip for Dynamite. I would have liked to seen someone like him or Chris Sprouse on Doc Savage. I liked the second issue better too. It didn't hurt having a story that included Pat Savage, The Fortress of Solitude and the Crime College.